Lipids represent a very diverse group of compounds with a high variety of physicochemical properties determining their functional activities. For omics-wide identification of lipid species from complex biological samples, several crucial analytical steps including extraction, chromatographic separation and mass spectrometry analysis need to be carefully considered and validated. Here we review applications of three main chromatography techniques—reversed phase, normal phase and hydrophilic interaction liquid chromatography—for analysis of complex natural lipidomes aiming to uncover the diversity of lipid species. To correlate lipid separation with their physicochemical properties, lipid chemical space was reconstructed and used to explain principles underlying different chromatographic techniques. Furthermore, examples of available methods for analysis of complex natural lipidomes characterized by high diversity and dynamic range of lipid concentrations are illustrated for adipose tissue lipidomics. The online version of this article ( https://doi.org/10.1007/s10337-018-3656-4) contains supplementary material, which is available to authorized users. Lipidomics, as the large-scale study of diversified molecular species of lipids, aims to address the identification, cellular and tissue distribution of lipids as well as related signaling and metabolic pathways. According to the International Lipid Classification and Nomenclature Committee, lipids are defined as “hydrophobic or amphipathic small molecules that may originate entirely or in part by carbanion-based condensations of thioesters and/or by carbocation-based condensation of isoprene units” . Lipids represent a very diverse group of compounds with high variety of physicochemical properties determining their functional activities. Amphipathic lipids play a key role in organization of cellular membranes not only by building its bilayer structure but also controlling membrane fluidity, positive and negative curvatures, organizing specialized domains and regulating activities of numerous membrane bound proteins via a variety of lipid–protein interactions . Many hydrophobic lipids are essential regulators of cellular and organism energy metabolism via tightly controlled mechanisms of fatty acids storage and release [3, 4]. Furthermore, signaling role of lipid-derived mediators is intensively investigated in relation to cell homeostasis and disease onset mechanisms [5, 6]. Such functional diversity and a high degree of specialization are possible due to the variety of chemical structures and large number of individual lipid molecular species. The LIPID MAPS consortium classified lipids into eight categories—fatty acyls, glycerolipids, glycerophospholipids, sphingolipids, saccharolipids and polyketides (originate from condensation of ketoacyl subunits), and sterol and prenol lipids (originate from condensation of isoprene subunits) . LIPID MAPS structural database at the moment (accessed October 2018) includes 43,124 lipids at fatty acyl/alkyl structure level considering experimentally detected and computationally generated structures. Furthermore, it was proposed that over 180,000 lipid species at fatty acyl/alkyl structure level can be derived by the perturbation of main building blocks of lipid structures without considering isomers with different positions of double bounds, backbone substitutions and stereochemistry . To address natural lipid diversity, numerous experiments were performed over the last few decades focusing on lipidomes of archaea, bacteria, yeasts, invertebrates, plants, and mammals . However, despite high number of predicted lipid structures, most of the studies reported a total number of lipid identification below 1000, far less than the numbers provided in available structural databases (Fig. 1). Reported lipidomes identified from each study object differ significantly in the distribution of lipid classes as well as molecular species in each class. Thus, 390 species representing six lipid classes were identified in human plasma with majority of the species corresponding to glycerophosphocholines, followed by glycerolipids and sphingophospholipids . 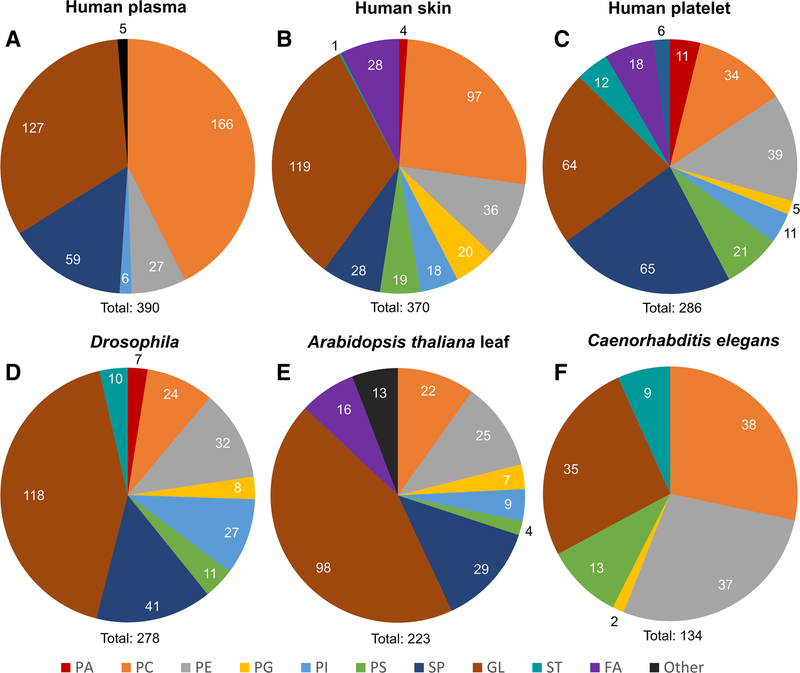 Furthermore, 370 lipid molecular species were identified in human skin  and recently quantitative values for 286 lipid species covering seven orders of magnitude in concentrations were reported for the human platelet lipidome . Studies of lipidomes in different human tissues illustrated a large variability in the number of identified lipids from different lipid classes (Fig. 1a–c). Thus, in human blood plasma, the highest number of species was identified among PC (43% of identified lipidome) followed by glycerolipids (33%). In human skin lipidome, the richest species diversity was shown for glycerolipids (32%) followed by PC lipids (26%). On the other hand, both sphingolipids (23%) and glycerolipids (22%) were among the most represented classes in human platelets lipidome. Lipidomes of other organisms were described in several studies as well. For instance, 278, 223, and 134 lipid species were identified in Drosophila melanogaster , Arabidopsis thaliana leaf , and Caenorhabditis elegans [14, 15], respectively (Fig. 1d–f). Available data demonstrate an extreme complexity of natural lipidomes which further underline the analytical challenges in lipidomics profiling for each biological matrix. Indeed, a relatively low number of experimentally detected lipids in comparison to predicted lipidomes as well as large variations in the number of identified lipid species between different organisms, tissues, and studies can be explained not only by the natural diversity of the lipidomes but also by the differences in applied analytical strategies including methods used for lipid extraction, separation, analysis, and identification. For omics-wide identification of lipid species from complex biological samples, several crucial analytical steps need to be carefully considered and validated. Due to the high chemical diversity of lipids, no single protocol, capable of extracting all lipid classes with the same efficiency, is available. Some of the most widely used extraction methods in lipidomics are based on liquid–liquid extraction and include Folch, Bligh and Dyer, and MTBE protocols . For very complex tissue samples with a large distribution of lipid concentrations (e.g., blood plasma and adipose tissue), additional fractionation of polar and unpolar lipids might be required to ensure high coverage of the lipidome. Development of high resolution and mass accuracy mass spectrometry techniques over the last decades had enormous effect on the development of lipidomics. Discovery or untargeted mass spectrometry (MS)-based lipidomics aims for the identification of as many as possible (preferentially “all”) individual molecular species present in the sample, and usually rely on shotgun and LC–MS based data-dependent acquisition (DDA) methods. Nowadays, limitations associated with DDA “undersampling” were at least partially solved by the availability of high mass accuracy and resolution mass analyzers operating at a high speed to provide a large number of individual MS/MS scans necessary for the molecular species identification. However, one of the main challenges in lipid identification is assignment of isomeric species which cannot be resolved by MS. For example, 22,830 lipid species at the fatty acyl/alkyl structure level corresponding to the five lipid categories characteristic for mammalian lipidomes (fatty acyls, glycerolipids, glycerophospholipids, sphingolipids, and sterol lipids) available at LIPID MAPS structural database, are represented by only 3099 unique elemental compositions. That means each lipid can potentially be represented by 7.4 isomeric species on average. Co-fragmentation of isomeric compounds results in mixed fragment spectra, increasing the complexity of peak integration, deconvolution, and lipid identification. Each unique elemental composition and thus identical exact mass can be represented by a dozen of isomeric lipids including positional, stereo- and regio-isomers. Moreover, the number of isobars that are unresolved at the chosen resolution of mass analyzers should also be considered. Figure 2 exemplifies the number of possible isomers and potentially overlapping isobars for phospholipid (mass range 755–765; Fig. 2a) and triglyceride (mass range 920–930; Fig. 2b) within 5 ppm mass accuracy, routinely delivered by the modern high-resolution instruments. Moreover, various types of adducts formed during lipid ionization add additional complexity to the separation and identification of isobaric and isomeric species. The identification of exact lipid at the fatty acyl/alkyl or higher structural identity levels from complex biological samples requires optimized instrumental configurations of LC separation together with high resolution mass spectrometer able to resolve potential isobars. Considering the number of possible isomeric/isobaric species as well as possible ion suppression effects in complex lipidomics matrices, chromatographic separation prior to MS analysis is often a method of choice for identification of exact lipid molecular species from complex biological samples. By providing orthogonal to MS separation of lipid species, LC–MS coupling increases peak capacity of the analytical platform, decreases suppression and matrix effects, allows chromatographic enrichment, and enhance reproducibility of the analysis. Several types of liquid chromatography are used in modern lipidomics. 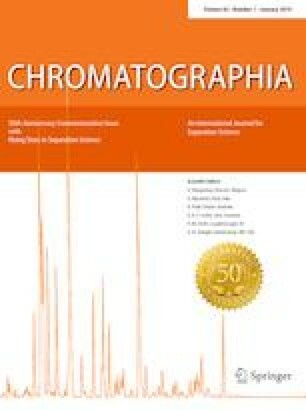 According to the meta-study performed by Cajka and Fiehn based on 185 original publications reporting LC–MS lipidomics applications, 71% of the experiments were performed using reversed-phase chromatography (RP-LC), followed by normal phase (NP-LC; 19%), hydrophilic interaction liquid chromatography (HILIC; 8%) as well as supercritical fluid chromatography (SFC; 2%) . The diversity of lipid chemical structures determines the choice of separation techniques used for the lipidome analysis. To model chromatography separation space, we selected 22,830 lipid structures available as .sdf files at LipidMAPS structural database, representing five lipid classes characteristic for mammalian lipidome as mentioned above. Using ChemAxon Instant JChem software (version 18.8.0, ChemAxon, Budapest, Hungary) , we predicted a set of 26 molecular descriptors to characterize main physicochemical properties of various lipids and visualized lipid chemical space using principle component analysis (PCA). Selected descriptors included mainly parameters influencing lipid chromatographic separation such as polarity (ASA_polar, TPSA), van Der Waals surface area, hydrogen bond acceptors/donors, hydrophobicity (LogP/LogD), hydrophilicity (HLB), polarizability, and ionic interactions (pKa, pKb, pI), as well as lipid exact mass and percent of C, H, N, O, P atoms. Figure 3a illustrates PCA scoring plot for the first two principle components explaining over 75% of variations in designed lipid chemical space. 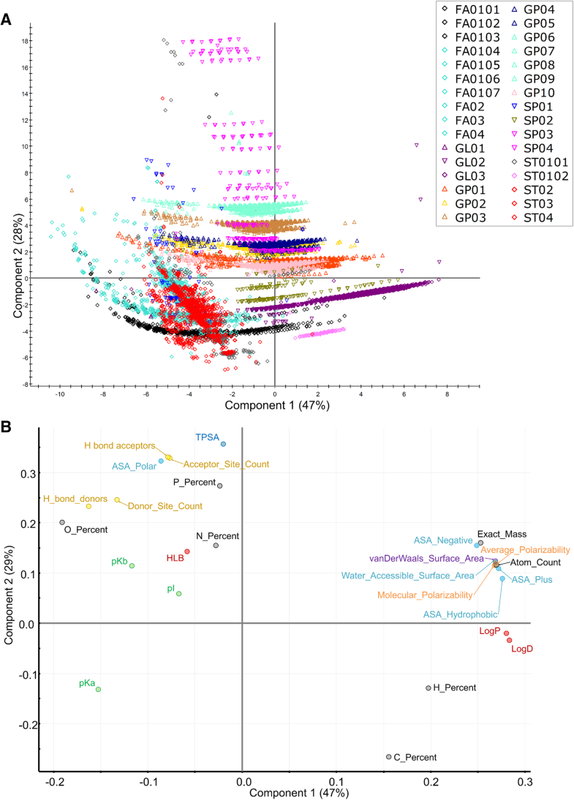 As expected, different lipid classes and subclasses occupy different space on the PCA plot. The first principle component (explaining 47% of the variations) clearly demonstrates separation of lipid species by increasing length of carbon chain in free or esterified fatty acid residues, corresponding to the contribution of the hydrophobic part of a lipid molecule. Whereas second principle component (explaining 28% of the variations) corresponds to the separation based on the lipid polarities represented by head group moieties. Thus, the first two principle components provide basic separation of variety of lipid species and can be attributed to the two main chromatographic techniques used in lipidomics—reversed and normal phase chromatography. Indeed, a closer look at the PCA loading plots (Fig. 3b) allows evaluation of the input of individual molecular descriptors on lipid species separation within chemical space represented by first two principle components (PC). Thus, distribution of lipids along PC1 demonstrated strongest positive correlation with logP/logD values and associated percent of C and H atoms mainly representing hydrocarbon chains of fatty acyl residues, reflecting lipids hydrophobicity. Positive correlation was also characteristic for the exact mass and atom count reflecting the size of the molecules as well as hydrophobic accessible surface area (ASA) and van Der Waals surface area. Average and molecular polarizability as well as positive and negative ASAs had similar input. pKa/pKb and pI values accounting for ionizable and thus more polar compounds as well as the whole set of polarity descriptors showed negative correlation with PC1. However, polarity measures represented the strongest positively correlated molecular descriptors for PC2. Those included H bond acceptor and donor count, polar ASA and topological polar surface area as well as percent of O, N and P atoms. Following section provides further details on lipid separation using the most popular LC techniques used in lipidomics—reverse phase, normal and hydrophilic interaction liquid chromatography. Reversed phase liquid chromatography (RP-LC) is a technique based on partitioning mechanism and solutes hydrophobicity. The unpolar stationary phase (SP) consists of silica microparticles functionalized with hydrophobic or mixed ligands—C30, C18, C8 hydrocarbon chains or cyano, phenyl, amino derivatives (listed in the order of decreasing hydrophobicity). The mobile phase (MP) is polar and usually made up from water and a water-miscible, organic solvent (e.g., acetonitrile, methanol, isopropanol). The retention mechanism is still a matter of debate but it is generally described as hydrophobic interactions between the solute and the immobilized hydrophobic ligands of the SP . SP-bound solutes may either be directly bound to the surface of the SP (adsorption) or completely engulfed by e.g., alkyl chains depending on the theory used to describe the system. The types of intermolecular interactions involved in RP-LC are polar including dipole–dipole, dipole–induced dipole, proton acceptor–proton donor as well as London dispersive forces between lipid molecules and hydrocarbon chains of the SP. However, the main mechanism of solute retention on hydrophobic SP can be explained by the hydrophobic effect . Generally, lipids are loaded onto the column in a relatively polar, aqueous solvent which induce partitioning of the hydrophobic parts of an analyte (e.g., fatty acyl chains) to the SP (Fig. 4a). The presence of unpolar hydrophobic hydrocarbon chains in aqueous solution is thermodynamically unfavorable since water molecules will preferentially maintain water–water interactions even at the cost of low entropy. Partitioning of unpolar lipid hydrocarbon tails into SP will minimize their interface with water molecules, thus increasing overall system entropy. The driving force of hydrophobic analytes partitioning into unpolar SP arise mainly from an increase in entropy of the system and to much lesser extent from London dispersive forces between lipid molecules and hydrocarbon chains of SP. Following increase in the percentage of organic solvent in the MP, analytes partitioning into it will increase resulting in lipids release from the SP. Organic solvents have lower polarity than water (water polarity factor—10.2). And most widely used MP components in RP-LC–MS lipidomics are acetonitrile (MeCN), methanol (MeOH) and isopropanol (IPA) with polarity factors of 5.8, 5.1 and 3.9, respectively. Lipid separation characteristic to RP-LC mostly represented along the first principle component of the PCA scoring plot visualizing lipids chemical space (Fig. 3a). Positive correlation between lipid separation along PC1 axis and calculated logP/logD values is clearly seen by comparing the vectors on the loading plot (Fig. 3b). Furthermore, strong positive correlation with molecular descriptors representing dipole–dipole interactions as well as molecular polarizability showed significant impact. Indeed, polarizability of lipid molecules has significant influence on retention in RPC. Thus, double bounds in fatty acyl chain decrease lipid retention due to increased polarity by pi electron dipole of the double bound. Based on the experimental data, it was calculated that equivalent carbon number (ECN) or partition number for triglyceride (TGs) can be calculated as ECN = HCN − 2n, where HCN is hydrophobic carbon number and n is a number of double bounds in fatty acyl chains. Furthermore, the presence of a charge will influence the retention of lipid species. In comparison to their neutral counterparts, charged lipids will have lower retention on RPC due to the higher polarity. Analytes in RP-LC elute in a very narrow range of MP composition and thus gradients can be optimized to yield good separation for several classes of analytes at once. To use advantages of RP-LC for more hydrophilic analytes and broadening the range of polarities for species separated by RP-LC, ion pairing reagents (e.g., TFA) may be used. Deprotonated polar functionalities bind via electrostatic interactions to positively charged solutes, thus increasing the overall hydrophobicity of the molecules due to the hydrophobic nature of the trifluoromethyl-functionality in TFA, enabling them to be separated on RP-LC. Other optimization parameters include MP additives (e.g., ammonium acetate and formate), column dimension, packing material, and end-capping techniques used to minimize the effect of residual silanol groups . Separation of constitutional isomers poses a great challenge to lipidomics. PL generally consists of two fatty acids esterified either in sn-1 or sn-2 position. Therefore, a lipid isomer can differ in chain length and level of unsaturation in the fatty acyl residues as well as in position (either sn-1 or sn-2). Optimized RP-LC solutions are indeed capable of separating those isomers varying in chain length and unsaturation level in the fatty acyl chains . Furthermore, the position of a DBs in fatty acyl chains determines their retention and thus separation is possible . However, RP-LC-based separation of sn-1/sn-2 constitutional isomers in PL has been a challenge up to date. RP-LC gradient elution in the separation of positional isomers cannot be achieved so far but application of isocratic elution has been shown to overcome those problems . The choice of stationary phase chemistry for lipid separation includes C4, C8, C18 and C30 RP columns with C18 being the most widely used. Application of sub-2 µm fully porous particles (FPP) found its wide application in lipidomics profiling due to the highly efficient, fast and robust separation of complex lipid samples . Alternatively, solid core particles (SCP) were reported to provide similar efficiency without generating a high backpressure associated with application of sub-2 µm FPP [26, 27]. One of the most popular eluent systems is based on water as a weak and isopropanol as a strong solvents. Often acetonitrile is additionally added to both solvents. As an additive, formic or acetic acids often in a combination with the corresponding ammonium salts are used in low mmol L−1 concentrations. Table 1 summarizes several examples of RP-LC application in lipidomics with the focus on RP SP chemistry, particle size and type, as well as used eluent systems (see Table S1 for further details). Normal phase liquid chromatography (NP-LC) is the second most popular chromatographic separation technique in lipidomics . NP-LC separates analytes based on their polarity. The SP is polar (silica or silica bonded phases) and MP consists of unpolar (e.g., hexane, heptane) and a miscible polar organic solvent (e.g., chloroform, isopropanol, ethylacetate). Binding of the analytes is based on the adsorption of polar parts of a solute (e.g., PL head groups) on a polar SP (silanol groups on Si particles) from unpolar MP, whereas unpolar parts of the solute play only a minor to no role (Fig. 4b). Thus, very hydrophobic species may not be separated with NP-LC. The retention of the analytes on a SP is driven mostly by non-covalent interactions including dipole-based, induced dipole-based, and H-bonds . Typically polar unbound silica SPs are used since they provide good polar retention coupled to low costs and high reproducibility. Several other polar-bonded phases have been investigated for their potential to separate lipid classes (silica-based polyvinyl alcohol, cyanopropyl, or dihydroxypropyl). Pure silica and diol phases are capable of separating neutral lipids, whereas cyanopropyl and polyvinyl alcohol phases can additionally separate PL subclasses [49, 50, 51, 52, 53, 54]. Different methods combining NP-LC and HILIC mode in a single analysis by addition of water-containing solvents have been used for efficient separation of both unpolar and polar lipid species using free silica or diol columns [55, 56, 57], whereas a similar separation can be achieved by cyanopropyl- and polyvinyl alcohol phases without the addition of water. The elution of analytes from the SP is performed by displacement or sorbtion from SP by increased proportion of polar solvents in MP leading to diminished solute–SP interactions. Separation characteristics in NP-LC may be optimized by changing polarity or composition of the solvent system. Polar eluent fractions are strongly binding to the stationary phase and may not be easily exchanged which in turn leads to longer equilibration and thus longer total run times [49, 51, 56, 58]. Furthermore, silanol groups have high affinity for water which is the most polar solvent used in chromatography. Usually even trace amounts of water in NP-LC solvent will lead to its strong binding on SP and thus resulting in the low reproducibility. Thus, NP-LC should be run under complete exclusion of water which gives the need for dehydration of solvents. Lipid separation by NP-LC closely resembles lipid distribution along the second principle component of the PCA plot (Fig. 3a) and is positively correlated with molecular polarity and H-bond donors and acceptors sites (Fig. 3b). Lipid adsorption to the SP dependents on a given polarity of a lipid molecule. H-bonding properties of a lipid arise from inner-molecular dipoles which in turn also describe its polarity. Increasing number/strength of dipoles in a lipid molecule leads to a higher retention due to increased dipole-based interactions with the SP. Generally, NP-LC is only capable to separate unpolar lipids (e.g., CE, Chol, MAG, DAG, TAG, FFA), whereas a separation of PL classes cannot be achieved [53, 58, 59, 60, 61, 62, 63]. Based on the PCA scoring plot (Fig. 3a), lipid classes are separated based on their polarities with the following elution order: CE, FFA/Sterols, TAG/DAG/MAG, and PL. Experimental data showed that NP-LC is actually capable of separating CE, FFA, TAG, Chol, 1,3-DAG, 1,2-DAG, MAG, PL, accordingly [53, 58, 59, 60, 61, 62, 63]. However, the elution characteristics (elution order, time, efficiency) can be changed by varying MP constituents and/or SP. Generally, NP-LC mobile phases consist of a hydrocarbons (e.g., hexane, heptane, iso-octane, cyclohexane) and a hydrocarbon-miscible polar solvent (e.g., IPA, acetone, EtOAc, MTBE) . Several additives have been found helpful in separation of unpolar lipid classes. Organic acids or bases (e.g., HOAc and TEA) can be used as pH modifiers to yield increased retention of FFA and PL . Furthermore, EtOAc or THF can be used at the beginning of a gradient (high hydrocarbon content) enhancing the discrimination of unpolar lipids, whereas EtOAc has been shown to be the better alternative due to its compatibility with PEEK tubing often used in HPLC systems . Furthermore, addition of acetone at the beginning of a gradient was shown to help DAG chromatographic stability . There are some disadvantages of NP-LC for online LC–MS coupling including long elution and equilibration times and low suitability of NP-LC MP (e.g., chloroform, hexane) for electrospray ionization (ESI). Typically, stable ESI requires relatively volatile, polar solvents such as water, acetonitrile, and methanol with addition of organic acids to enhance analyte protonation. NP-LC unpolar solvents are not capable to accept or donate protons to the analytes thus preventing efficient ionization. Low conductivity and high resistance of non-polar solvents in NP might significantly decrease spray stability. Thus, dopants or post column mixing with other protic solvents to ensure ionization efficiency are often required . Furthermore, special care should be taken due to high flammability of NP-LC solvents and ESI source housing should operate under well controlled pure nitrogen atmosphere. PEEK tubing usually used in ESI sources is not resistant to THF or chloroform and should be substituted with fused silica. 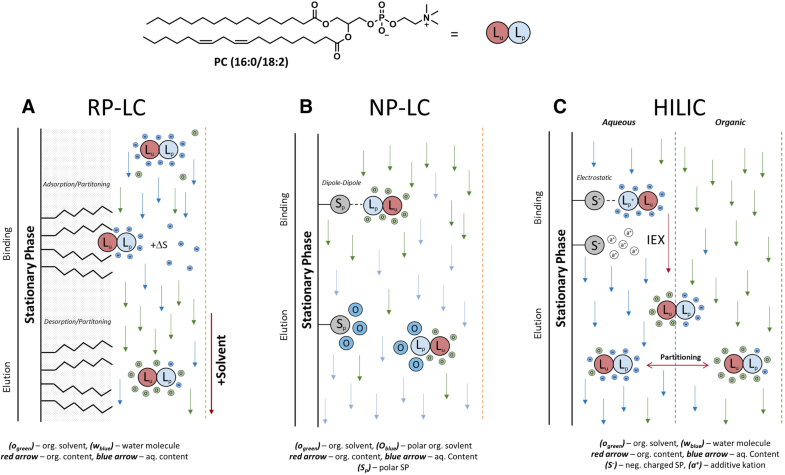 Tables 2 and S2 summarizes several examples of NP-LC applications in lipidomics with the focus on NP-LC surface chemistry, stationary phase particle size and type, as well as used eluent systems. The choice of stationary phase chemistry for lipid separation includes pure silica, polyvinyl alcohol (PVA), cyanopropyl (CN) and dihydroxypropyl (Diol) columns with pure silica being the most often used. Application of 3–5 µm FPP is by far the most used stationary phase. Independent of SP, eluent systems consist of hydrodcarbons as weak solvents and more polar, miscible solvents as strong solvents. Additives are depending on solvent system and SP, and generally are acetic acid (1–0.001%) and ammonium acetate buffers with low molarities, as well as TEA, THF and IPA. Due to the number of limitations of NP-LC especially for LC–MS applications, hydrophilic interaction liquid chromatography (HILIC) became a more popular method of choice for separation of lipids based on their polarities. HILIC is used for the separation of polar and/or ionized analytes that display limited retention in reversed phase chromatography (RP-LC). Polar SP is generally represented by silica or functionalized silica and MP is based on water and water-miscible organic solvents. The elution order is based on head group polarity and thus orthogonal to RP-LC separation. Another considerable advantage is that HILIC display increased sensitivity in LC–MS caused by the high organic content of the eluent leading to better ionization of analytes . The retention mechanism in HILIC is multi-modal and based on a combination of analyte partitioning and its dipole–dipole-, H-bounding and electrostatic interactions with a SP (Fig. 4c). In HILIC, the MP contain at least 2.5% of water which is partially immobilized on the SP . Analytes introduced into the system are separated based on their ability to partition between bulk organic fraction of the MP and the water buffer layer on the SP. Furthermore, once in the aqueous layer polar or ionized analytes may interact with the SP by electrostatic or dipole-based interactions, in combination leading to a retention based on the polarity, charge and electron-density distribution [67, 68, 69]. HILIC SP are usually classified based on the charge characteristics into neutral (e.g., amide, cyano, diol), charged (mainly amine, bare silica), and zwitterionic (e.g., sulfobetaine) phases [70, 71, 72]. Introduction of the charged group in SP allows to modulate analytes binding to SP based on the ion-exchange mechanisms. Therefore, HILIC separation is a combination of partitioning, ion-exchange chromatography, and H-bonding. In general, analytes are loaded on the column with a high organic content and are eluted by increasing the percentage of water in the MP leading to dampening of polar interactions between SP and analyte. Often used HILIC phases are unbound silica phases or polar bonded phases, whereas the most widely used modified phases are polyvinyl alcohol and dihydroxypropyl modified silica SPs. Investigations on the role of SPs in lipid separation showed substantial differences in elution order in the case of specialized bonded phases with 2-picolylamine, diethylamine, 1-aminoanthracene, and diol phases using the same mobile phase . Recently, application of zwitterionic HILIC SP iHILIC Fusion in combination of optimized concentration of ammonium acetate allowed to separate not only different classes of PL but also constitutional isomers such bis(monoacylglycero)phosphate (BMP) and PG lipids . To optimize/change separation characteristics of the system, MP can be tuned by changing either (1) polarity of the organic solvent (increasing polarity leads to lower retention) (2) water content or (3) addition of buffer additives as pH modifiers. Typical additives include ammonium formate, ammonium acetate, formic acid or ammonium hydroxide. MP additive supplementation changes system pH which in turn affects dissociation states and thus analyte–SP polar interactions, either favoring or disfavoring specific retention. For example, increasing molarity of ammonium formate results in (1) lower MP pH, favoring protonation of analytes and/or SP and thus changing elution order and (2) displacement of bound analytes from SP via electrostatic interactions due to the increase in ionic strength (i.e., ion exchange mechanism). Thus, pH changes may lead to improved retention, peak shapes and sensitivity by shifting dissociation equilibria of analytes to single dissociation state and thus diminishing peak tailing . An extensive study has been performed by Cífková et al. which showed that adjusting the pH to 4 in all solvents yields a single dissociation state of each PL class and thus yields good peak shapes . Similar to NPC, HILIC is not able to separate lipid molecular species but rather separates lipids based on their head group polarity which is mostly reflected by PC2 in the PCA loadings plot (Fig. 3). Positive correlation has been shown with molecular descriptors associated with lipids ability to form H-bonds arising from molecular moieties featuring dipoles. Those dipoles increase the polarity of a lipid, whereas increasing/decreasing number or strength of dipoles leads either to increased or decreased partitioning ability or adsorption thus changing elution characteristics of a lipid class. Another important aspect is a lipid dissociation state, described by the negative correlation of PC2 with lipids pKa values. 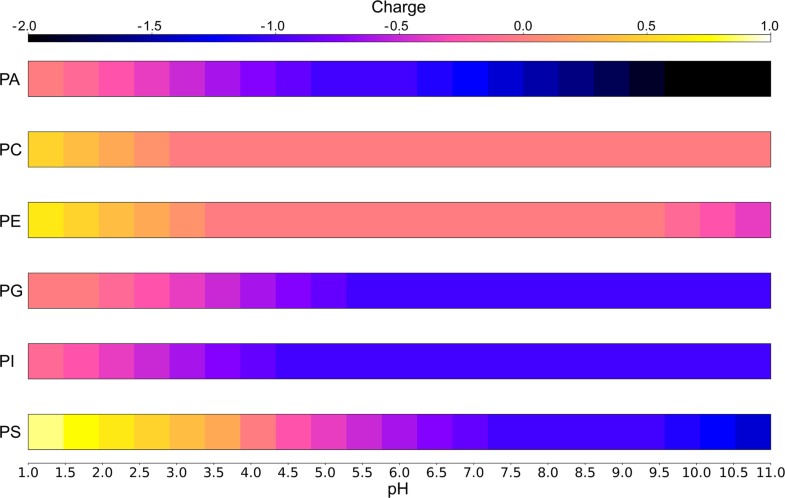 Changes in a net charge or charge distribution lead to changes in partitioning into the aqueous layer of the SP as well as its adsorption properties. HILIC is not well suited for the separation of molecular species, however, it has been shown that increasing chain length and saturation of FFA constituents leads to lower retention and thus earlier elution . Experimental data show some differences in lipid elution order. Typically, charge-neutral lipids such as ceramides, PE, PC, SM and LPC (listed in the order of elution) have a defined elution order independent of MP and SP [53, 76, 77, 78, 79, 80]. Moreover, separation of acidic PL strongly depends on (1) MP pH, (2) application of pH/ion strength gradient and (3) SP surface chemistry. An in-depth investigation of those phenomena has not been performed to date and due to the complexity of inter- and intramolecular forces during HILIC separation no general considerations can be made here. The majority of used MP consists of acetonitrile and aqueous buffers (ammonium formate and acetate), supplemented with minor amounts of IPA, MTBE, MeOH or other polar, water-miscible solvents. Buffers may be used in MP as pH modifiers to obtain single dissociation states of lipid classes required for a sharp peak shape or as ion strength gradients to achieve ion exchange-like mechanisms with the SP. When comparing ammonium formate and acetate it was found that addition of ammonium acetate yields better signal intensities whereas ammonium formate, despite decrease in signal intensity, resulted in better peak shapes . Tables 3 and S3 summarize several examples of HILIC application in lipidomics. The choice of SP chemistry for lipid separation includes pure silica, PVA, diol, sulfobetaine (ZIC), charge modulated hydroxyethyl amide (iFusion) and hydride-bonded phase columns with bare silica being the most often used. Several FPP sizes were evaluated and seem to be suitable for HILIC, including 3–7 µm as well as sub-2 µm particles. Most popular eluent choices are based on acetonitrile as weak and water as strong solvent. Used additives are exclusively low molarities of ammonium formate and acetate. Another chromatography type used for lipid separation is silver ion chromatography or argentation chromatography (Ag-HPLC). It will not be discussed here in detail but for further information readers are referred to the excellent book chapter by Holčapek and Lísa about theoretical considerations and practical applications of Ag-HPLC in lipidomics research . In brief, Ag-HPLC separation relies on the formation of polar complexes between silver ions and double bounds (DBs) in unsaturated fatty acyl residues by the formation of transient coordination bonds. Retention of lipids is therefore dependent on (1) the number of total DBs in the fatty acid residue, (2) chain length of fatty acid residues, (3) distance between DBs and (4) configurational isomerism (E/Z) of DBs . Elution of retained lipids from the column is achieved by different solvent systems including chlorinated solvents such as DCM or dichlorethane with the addition of polar modifiers such as MeCN and acetone, or MP based on MeOH and hexane with MeCN as polar modifier. It has been shown to be a powerful tool in lipid science and lipidomics research due to its ability to separate free fatty acids as well as their methyl esters , TAG molecular species as well as regiosiomers of TAGs . Furthermore, its suitability to be used in comprehensive lipidomics analysis has been shown by either off-line or online coupling to NARP-LC  and RP-LC  to mass spectrometry detection. RP-LC is the most often used chromatography for the full untargeted lipidome profiling providing the separation according to the hydrophobicity of the molecule, the length of fatty acyl chain and number and position of double bond. RP-LC also provides possibility to separate isomeric and isobaric lipid species. Overall, polar lipids (especially lysophospholipids) are the least retained compounds. On the contrary, nonpolar lipids (CE and TG) are the latest eluting . Rational selection of the RP-LC column should be done to address the challenge of particular lipidome being analyzed. Peak capacity and resolving power of different columns depend on the type of SP (chemistry, end-capping, surface charge) as well as particles size and type (porous, porous shell and sub-2 µm particles). In RP-LC, the chemistry of the columns influences mostly the separation power. Recently, RP-LC separation using C30 chemistry SP was used to resolve triayclglycerol isomers with different sn-positions or composition of fatty acyl groups . On the contrary, a C8 column with low surface charge silica was shown to be beneficial for the separation of very polar lipids as LPC(13:0) and LPC(14:0) . In the majority of RP-LC studies, fused core columns yield the narrowest peaks and highest number of theoretical plates [25, 26, 27]. Exceptions could be noticed for PCs, which in the study of Wittig et al. showed similar peak width and plate numbers between the fused core and fully porous silica with low surface charge columns. Fused core columns were found to provide also the best number of lipid identifications or LC–MS features [25, 27]. On the other hand, HILIC separation of lipid classes is generally considered to be more convenient for MS-based lipid quantification using lipid class specific internal standards, due to the coelution of the standard with the corresponding lipid class providing ionization at identical MP composition. Recently, Cifkova et al. compared nine different columns operating in HILIC mode including four bare silica SP of different particle size and type, four modified silica columns (diol, 2-picolylamine, diethanoamine, 1-aminoanthracene) and hydride silica phase. Hydride silica column showed high performance especially for the peak shape of acidic phospholipids (PA, LPA, PS, LPS). MP tuning is crucial in lipidomics, and the choice of suitable additive and their concentrations can influence a peak shape of some lipid classes. For instance, lipids with terminal phosphate groups including PIPs, PA, LPA, and ceramides with phosphorylated 1-hydroxy group of sphingoid base show undesired peak tailing in both RP-LC, NP-LC and HILIC applications due to the interaction of phosphate groups with stainless steel material in the flow path of the HPLC systems. Supplementation of the MP with phosphate buffers (rarely used in LC–MS application due to the low volatility of phosphoric acid) or adding phosphoric acid in the samples significantly improved peak shapes for the lipids with terminal phosphates . Alternatively, substituting all HPLC tubing to PEEK material was shown to reduce undesired peak tailing . Existence of different dissociation states of PL at different MP pH is an additional challenge in optimizing lipid LC separation. Charged, ionized states of the molecules are more polar than their neutral counterparts. The presence of lipid in more than one dissociation state during separation results in peak broadening and tailing [73, 76]. All zwitterionic (PC, PE) and neutral lipid classes exist mostly in one dissociation state above pH 4. However, for acidic PL such as LPA, PA, LPS, and PS several dissociation forms can exist along pH range from 1 to 11 (Fig. 5). It was demonstrated that sharper peaks during HILIC separation can be obtained using MP with pH 4. Three different concentrations of ammonium formate (10, 20 and 50 mmol/L) were compared for HILIC-based lipidome analysis and the best peak shapes for PS were obtained with the highest salt concentration . Similar results were obtained in different studies based on RP-LC lipid separation [32, 99]. When selecting pH of the MP for lipid separation, it is also important to keep in mind that at pH above 5 residual silanol groups of the SP material will become deprotonated and can interact with positively charged groups of analytes . Each described chromatography mode relies on a certain physico-chemical properties of lipids and thus serves specific applications in lipidomics. To get a comprehensive view on lipid composition in complex biological samples, combinatorial approaches have been developed in the past years that ought to combine the separation power of different LC systems in the form of two-dimensional LC (2D-LC) separations. Those so-called comprehensive approaches have enabled researchers to identify and quantify complex, so far unknown lipidomes. Separation of complex lipidomes with varying ranges of concentrations of different lipid classes poses a big problem in identification and quantification of lipid molecular species. In one-dimensional separation, lipids are predominantly separated based on certain set of properties which can hardly resolve the wide range of physico-chemical diversity of lipids. Thus, RP-LC is capable of separating lipids according to their hydrophobicity which is determined by the length of the fatty acyl chain and number and position of DB . On other hand, NP-LC and HILIC provide the opportunity for separation based on lipid polarities and thus provide efficient separation of lipid classes. Obviously, the combination of two chromatographic techniques will allow comprehensive orthogonal separation with significantly higher peak capacity of the system. Furthermore, in LC–MS applications, lipid ionization in the ion source and thus identification and quantification in general suffer from lipid coelution as well as from a high dynamic range of lipid concentrations in different matrices. In 2D-LC approaches, high abundant lipids may be separated from lower abundant lipids and can be analyzed separately. Moreover, 2D-LC approaches display an increased peak capacity and greatly enhance the number of identifications compared to 1D separations. However, those advantages go along with a more laborious, time-intensive analysis which enables only a low to medium throughput at best. Multidimensional LC separations can be either coupled off-line or online. Off-line approaches rely on separation and fraction collection during the first LC with subsequent solvent evaporation, resuspension and second dimension separation. This approach allows for full optimization of both separation conditions independently to obtain the most comprehensive characterization of a lipidome. The disadvantage here is that due to time-consuming steps this is not suitable for large scale lipidomic screening studies. Several different chromatography and column types have been combined by off-line coupling including HILIC/RPC [78, 100] SFC-Ag+/NARP-LC , RPC/Ag+ , RPC/RPC , and NP/RPC . Thus, combination of HILIC separation using bare Si column and MeCN–water gradient in the presence of 5 mmol/L ammonium acetate was used to separate lipid classes in porcine brain. Collected fractions were dried under the nitrogen stream and dissolved in MeCN–IPA for the separation on the C18 RP column using water–MeCN–IPA based MP for the elution of individual lipid species with a variety of acyl length chains . Application of 2D LC off-line separation of rat plasma and liver lipidomes allowed to increase twice the number of lipid identification. Samples were separated into 13 fractions representing 22 lipid classes using monolithic Si column separation in NP-LC mode followed by fractions analysis on RP-LC system with C30 column . Online approaches in general are faster and can be more automated but the chromatographic resolution of second dimension needs to be adjusted at the cost of sampling time in the first dimension . Online connection of different LC systems must be thoroughly planned and parameters such as solvent suitability, column sizes and column connections need to be optimized. A wide range of combinations in the form of 2D-LC were developed including Ag+/RPC [104, 105] RPC/HILIC [106, 107], HILIC/RPC [86, 108], NPC/RPC [109, 110, 111, 112] and strong anion exchange/RPC , RPC/RPC [114, 115]. Online combination of RP-LC separation on C18 column followed by fast HILIC separation using bare Si SP allowed automated comprehensive separation and identification of lipids from four lipid categories and ten lipid classes in human plasma and porcine brain . Comprehensive 2D-LC system consisting from capillary strong anion exchange (SAX) chromatography and nanoRP-LC separation was used for lipidomics analysis of human plasma and allowed identification of 303 lipid molecular species corresponding to 14 different lipid classes . To illustrate wide range of LC–MS applications for complex natural lipidomes, we provide the overview of analytical strategies used for the analysis of the adipose tissue lipids. Over the last decade identification of the adipose tissue lipidome and its alterations attracted much attention due to intensified research in obesity and related metabolic diseases. Obesity has reached epidemic proportions in modern societies with a prevalence of more than 20% of the population and has been recognized as a risk factor for numerous metabolic disorders including type 2 diabetes (T2D), cardiometabolic, liver, and renal diseases . Onset and disease progression is closely associated with metabolic reconfiguration of white adipose tissue (AT) showing the important role of lipids and lipid related metabolites in white AT expansion and development of the disease . Indeed, previously seen as an inactive depot for energy excess in the form of triglycerides and cholesteryl esters, nowadays AT is recognized as an active player in regulation of whole body metabolism, inflammatory signaling and insulin sensitivity . To understand the underlying mechanisms of obesity development and in particular the regulation of lipolysis and lipogenesis, lipidome of AT and disease associated changes need to be characterized. AT is a particularly challenging material for lipidomics analysis. Triglycerides represent more than 99.8% of adipose tissue lipidome . Such high dynamic range of lipid concentrations in adipose tissue requires high sensitivity and selectivity of the separation method. Moreover, the presence of a high number of isobaric and isomeric species is an additional challenge for LC separation. In comparison to blood plasma, lipidome of AT is much less studied. To illustrate application of LC techniques for analysis of AT lipidome, we were able to identify 24 research papers published between 2007 and 2018 (Table S4). Two publications focusing on separation of neutral lipids (mainly TGs) relied on the application of NPC using Si columns and hexane–MTBE or hexane–IPA–MeOH gradients [120, 121]. Both studies used longer columns (150 and 250 mm) with a large internal diameter of 4.6 mm providing high capacity and separation efficiency for high abundant isomeric TGs. Using post-column addition of ammonium acetate and positive ESI MS detection, 31 TGs were identified , whereas the second study utilized evaporative light scattering detection . A single publication referring to the application of HILIC for AT lipidomics relied on the amide BEH stationary phase and acetonitrile–water gradient with ammonium acetate at pH 9 used as an additive . Using UPLC separation (particle size 1.7 µm) coupled online to MS detection, main lipid classes including TG, DG, Cer, PI, PE, PC, and lysoPC (listed in the order of elution) were separated and identified. However, most of the publications (21) reported the application of RPC for a separation of complex lipidome from human, murine and horse AT as well as 3L3-T1 adipocytes. Two studies focusing on the analysis of AT TGs used either regular C18 column with water/MeCN/IPA gradient  or non-aqueous RP on C30 column with MeCN–IPA elution  which allowed to identify 124 and 79 TG molecular species, respectively. Most of the RPC application aimed to cover the whole variety of AT lipid classes. One of the most popular LC methods, developed by the group of Matej Oresic, is based on UPLC separation on C18 BEH columns (1.0 or 2,1 × 50 or 100 mm, 1.7 µm particle size) using water–MeCN–IPA gradient with formic acid and ammonium formate as additives [117, 119, 125, 126, 127, 128]. Using this approach and online MS analysis, 314 lipid molecular species were identified representing one of the highest number of lipids identified in AT so far . Unfortunately, the full list of identified lipids was not provided. The highest number of identified lipids (329) with the widest lipid class coverage (FFA, lysoPE, lysoP, PE, PC, PI, PG, PS, SM, Cer, hexCer, DG, TG) was reported for murine AT lipid extract separated on C8 BEH column (2.1 × 100 mm, 1.7 µm) using water–MeCN–IPA gradient and ammonium formate as an additive . C4, C5 and C8 RPC columns were applied in several studies [122, 130, 131, 132, 133, 134], however, still the majority of the published results were obtained using C18 stationary phase. In terms of MP selection, mainly water–MeCN–IPA gradients were used. Often when lipids are identified as a part of metabolomics profiling, C4 or C18 columns with water–MeOH gradient are used for the separation . It is important to note that the number of identified lipid species in AT lipidome depends not only on the efficiency of a chromatographic separation, but also other components of the analytical workflow including lipid extraction, mass spectrometry analysis and lipid identification. Additionally, many authors report only significantly regulated lipids in the studied systems and do not provide the full list of identified lipids species, which makes it difficult to compare and validate the AT lipidome coverage. Full description of lipid molecular species present in AT is required not only for LC–MS methods comparison but also for integration of lipidomics data in systems biology and medicine workflows with high predictive and diagnostic potential. Financial support from the German Federal Ministry of Education and Research (BMBF) within the framework of the e:Med research and funding concept for SysMedOS project (to MF) and EU H2020 funded project MASSTRPLAN (Grant number 675132; to MF) are gratefully acknowledged.